So I used to work for a farm stand that sold local produce. And I can’t tell you how many times people would come and ask if we had local corn. In JANUARY! There was snow on the ground outside and people wanted local corn! So here are 5 foods that are in season in May! I grew up gardening so I understood what vegetables were in season in my area at what time, but I’ve come to understand that a lot of people just don’t know what types of produce are in season. Everyone is used to being able to go to the grocery store and buy whatever they want in whatever season they want. And many people don’t understand that this produce is shipped in from other areas. I highly recommend eating locally grown fruits and vegetables whenever possible. Not only does it taste better, but many times if you’re buying produce at your local farmers market you can interact with the farmer who grows your food! This is amazing because you can learn more about their growing practices and you know exactly where and how your food was grown. One thing I’ve learned is that many farmers (at least in my area) use minimal to no pesticides on their crops, but they aren’t certified organic because the certification process is long and expensive. So if eating produce that hasn’t been sprayed with pesticides is important to you talk to your local farmers and see how they grow their crops! I also just love being able to talk to the people who grow my food! It’s fun and you come to appreciate all of the hard work that goes into growing produce. One of my favorite tools to use is the Seasonal Food Guide. You can put in your location and it will tell you exactly what foods are in season in your area based on the month! This is an amazing tool and it allows you to see exactly what foods you should be looking for at your local farmers market. Now I know that not everyone lives in an area where there is delicious produce all year round. 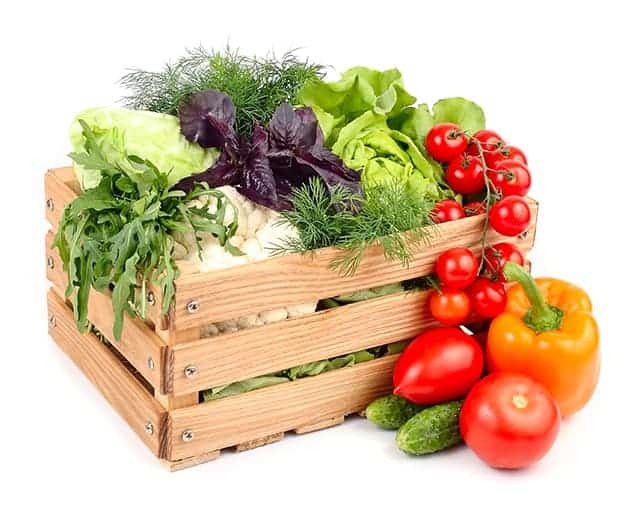 Eating a variety of fruits and vegetables is important so sometimes you do have to eat food that isn’t grown locally, especially if you live in an area with long winters and a short growing season. But even if there isn’t locally grown food available it’s important to choose food that is in season where it is being grown in order to get the best taste! Keep in mind that this is a guide for what foods are in season here in the U.S. and it could be different depending on where you live! If you live in California you’re in luck because there are tons of foods in season all year round. However, if you live somewhere that has long, cold winters (Like me!) there aren’t as many options. I always recommend heading to your local farmers market first to check out what’s growing in your area or using the seasonal food guide to see what’s in season locally. So growing up my mom never cooked asparagus because she didn’t like it so I didn’t learn about how amazing asparagus is until I got to college! I decided to try it out one day and I loved it! I love this garlic butter sauteed asparagus recipe! 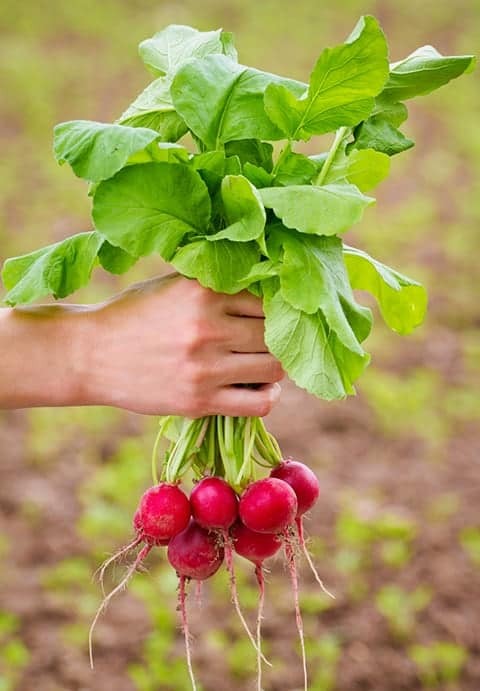 Radishes are just beginning to come in season in May. I was never a big fan of radishes, but then I tried this amazing crispy roasted garlic radishes recipe and I’m hooked. So chives are the best! They add an amazing flavor to any recipe and they’re in season in May! Check out these amazing Cheddar and Chive biscuits! 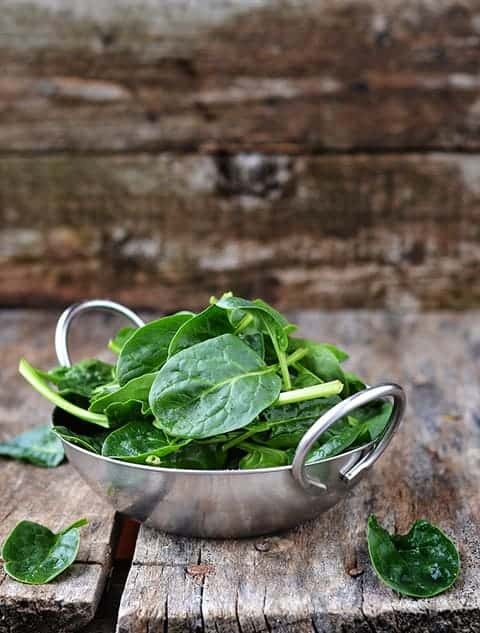 I LOVE spinach! I’m so glad it’s in season in May! I love spinach salads like this cranberry almond spinach salad! Do you try and eat seasonally and choose food that is locally grown? Let me know of any tips you have for eating local produce in the comments!